In non-breeding plumage, the male has olive crown, nape and upperparts. On the upperwings, the flight-feathers have yellow fringes, whereas the upper mantle has variable yellow and black markings. On the head, face and ear-coverts are olive with paler mottling, and we can see an indistinct supercilium. The eyering is distinct but the caruncles are reduced. On the underparts, throat and breast are white to yellow-olive and show scaly pattern. Belly and undertail-coverts are uniformly yellow. The adult female resembles non-breeding male. She has orange-yellow eyering and gape. The immature is similar to female. Some young males may have developed caruncles but with same plumage as female. The Schlegel’s Asity is patchily distributed in N, NW and W Madagascar, from Andavakoera in N, S to 70 km N of Morondava in W.
The Schlegel’s Asity frequents the seasonally dry rainforest in NW, the western deciduous forest and locally in W also the dry forest close to humid or sheltered areas. The species is visible from sea-level up to 800 metres of elevation. The song of the Schlegel’s Asity is a quiet, penetrating, high-pitched whistle of 7-10 notes lasting 1-2 seconds, first rising and then falling in volume “tsee-tsee-tsee-tsee”. 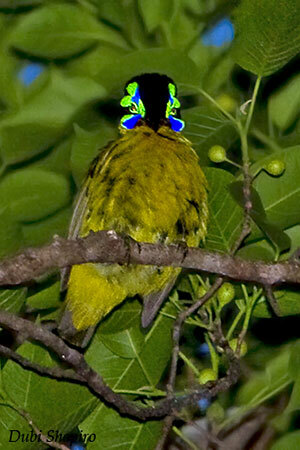 This song is usually given from top of canopy tree of from within the vegetation, making the bird difficult to locate. Some quiet squeaks can be heard during the displays. The Schlegel’s Asity feeds primarily on small fruits during the rainy season, mainly fruits of Apocynaceae. It takes mostly nectar and insects in late dry season. The nectar is taken from mainly red, reddish and whitish flowers such as Combretum, Albizia and exotic Eucalyptus. Insects and spiders are found under flaky bark or in hanging dead vegetation. It probes bark crevices too, and may catch aerial insects. It forages from canopy to understorey, usually alone but also in small groups outside breeding season. It may sometimes join mixed-species flocks. Like other asity species, the Schlegel’s Asity has complex breeding system. From an observation of courtship display, a male was displaying in front of a female, dropping its wings and fluffing up the breast feathers, while the tail was gradually raising over the back. This behaviour was accompanied by quiet squeaks. The male accompanies (and probably guards) the female collecting nest material and it may help in nest-building. It sings from within a restricted area indicating that the Schlegel’s Asity could have dispersed leks. But more information is required. The Schlegel’s Asity is sedentary in Madagascar. The flight is fast and direct, with a whirring sound produced by the wings. The nest-building occurs between October and December. Polygyny is a possibility, but the breeding strategy appears to be flexible according to availability of resources. The female builds a globular woven structure suspended from a branch, usually between 2 and 5 metres above the ground in the understorey. The male may help her. The nest is made mainly with moss, although in W of the island where there is little moss, the bird adds strips of bark and dead leaves, held together with spider web. The clutch size is not documented. No more information. The Schlegel’s Asity is threatened by habitat loss, as forest habitats are under intense human pressure. Forest destruction by burning, cattle-grazing and wood extraction involves heavy degradation of this habitat. However, the species occurs in some naturally protected areas. The population is declining due to habitat destruction. The Schlegel’s Asity is currently listed as Near Threatened. The Schlegel’s Asity is endemic to Madagascar. It occurs in the north-west where it is common, but it is more patchily distributed along the west coast. It frequents both evergreen humid forest in NW and dry deciduous forests in W. It feeds on small fruits and nectar depending on the season. It typically nests in suspended globular structure. The male in breeding plumage shows conspicuous blue and green supraorbital caruncles, making it unmistakable. The Schlegel’s Asity is threatened by habitat loss through deforestation and degradation of forests. The species is currently listed as Near Threatened. The Schlegel’s Asity is a rotund bird with short bill, legs and tail. The adult male in breeding plumage has bright yellow upper mantle and underparts. Rest of upperparts is olive-green. Upperwings and uppertail are browner with pale olive fringes. Underwing-coverts and axillaries are pale yellow. The undertail is dark greyish. On the yellow underparts, chin to breast and flanks show narrow, olive-green fringes to feathers. The head is black. We can see a conspicuous featherless, bright blue and green wattle, some fleshy excrescences of the dermis above the eye. This ornament includes a green eyering, a bright apple-green wattle extending in front and below the eye, and two lobes behind the eye. There is a sky-blue area above and below the eye. This bright-coloured ornament contrasts strongly with the black head. The bill is blackish with orange-yellow gape. The eyes are dark brown. Legs and feet are grey.